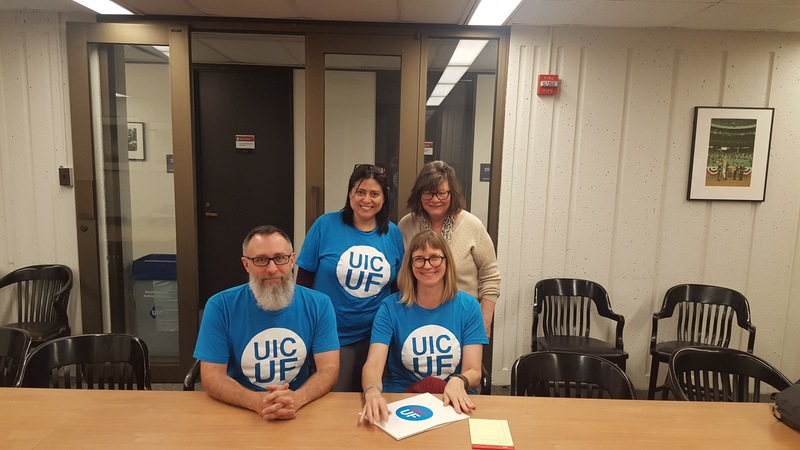 One month ago, on May 9th, UIC United Faculty presented UIC Administration with our demand to bargain over what will become our third contract since the union was founded in 2012. Last week, the university responded with proposed meeting times, and we have mutually agreed to several dates for our opening negotiating sessions. We can now announce that our first session will take place on Wednesday, June 20th, from 2pm-5pm. We will announce the location when confirmed. While the bargaining process has just begun, the bargaining team has been meeting regularly since Fall of last year to prepare. We have spent that time surveying the membership on bargaining priorities, crafting contract proposals, and preparing for the challenges of meeting our administration at the negotiating table. We hope our efforts will facilitate an efficient and productive bargaining process. However, we are ready to stand our ground, if need be, to win the human capital our university needs to thrive, dignified salaries that allow members to reside in the Chicagoland communities that we serve, and shared governance processes that empower all faculty. As ever, the willingness of our members and our communities to be active observers and participants in this process are what we need in order to achieve the best outcomes possible. Therefore, for the duration of the bargaining process, we will be issuing periodic updates via email, facebook, twitter, and here on our website. We strongly encourage everyone to like and follow us on social media, and consider supporting the bargaining team by attending a rally, 30 minutes prior to the first session. Details for the rally will be announced shortly. With your support, we can make UIC an even better place to work and learn! Stagnant salaries amid rising costs of living in the Chicago area. Changing demands on faculty pursuant to rapid enrollment growth at the University. Shared governance principles that must form the backbone of decision-making at the University. Faculty at UIC provide top quality education for students in the Chicago area, and perform research that deepens knowledge and improves lives the world over. Yet despite raising salary minimums 40% since our first contract, we still have faculty who are paid well below the median income for our community. At the same time we are being asked to accept an ever expanding list of duties. Therefore, we will pursue increasing salaries for our lowest paid faculty, as well as improved salary pools across the board. We will also work to keep faculty from bearing the burden of increasing healthcare costs, which politicians are callously trying to pass on to workers. The University has pleaded poverty for years amid stagnating salaries, while pointing to no-budget austerity measures as justification. Administration owes it to the entire UIC community to fight alongside our members for adequate funding that will address years of lost income growth among faculty, without laying the cost at our students’ feet. UIC faculty are proud to serve the communities of Chicago. We deserve the dignity of a professional income in our hometown. Additionally, our University is projecting and planning for rapid growth over the coming years. As UIC fervently pursues its capital campaign to fuel this growth with new classrooms and dorms, it must also pursue a parallel human capital campaign to effectively handle the influx of new students. While non-tenure track faculty play a key role in realizing the goals of our university, a commitment to sustained student growth should be matched with a commitment to sustained growth in secure, tenure-line positions, which are critical to the operation of a top research university. The United Faculty are also concerned with threats to shared governance. Statutes and bylaws are too often ignored. Meanwhile, discussion and advisement are not always required for critical issues facing faculty, like merit determinations or appropriate workloads. We intend to address disparities, and ensure that the spirit of shared governance is applied to important questions affecting all our faculty. We hope that the University administration will join us in negotiating a timely and effective agreement. We will be keeping you informed throughout this process, and encourage our members to participate by attending and respectfully observing the negotiating process. 08 May UIUC Non-Tenure Track Ratify Their First Contract! Great news! Our sister union at University of Illinois at Urbana/Champaign, Non-Tenure Faculty Coalition, Local 6546, (AFT/IFT/AAUP) has ratified its first contract by an overwhelming majority. UIC United Faculty congratulates NTFC, as well as Interim Chancellor Barbara Wilson and Interim Provost Edward Feser, for reaching an agreement that will provide the teaching faculty at UIUC with some modicum of economic security and academic freedom. This collective bargaining agreement represents a significant step forward for the teaching mission of UIUC. The IELRB recognized NTFC in July 2014. They began bargaining their contract in October 2014. The new, five-year contract will provide full-time non-tenure-system faculty at UIUC with three-month advance notice rights prior to the beginning of the semester, and one year of extra job security for long-term faculty, beyond the duration of their current one-year contract. * Clear reappointment policies (notice by May 1). Note: multi-year contracts will continue through college policies, and will be encouraged. As reported at our membership meeting last month, we drafted and sent in January a joint letter from the UIC Academic Professional Advisory Committee, UIC Faculty Senate, UIC Staff Advisory Council, and UIC United Faculty to President Killeen regarding our serious concerns about anticipated changes in health care costs. These are also concerns of our Chancellor, who has met with the president and other UI chancellors. The response we got was disappointing, taking a “wait and see” approach. Our joint response in a letter sent two weeks ago was to meet as soon as possible, to prepare and develop potential strategies laid out in our initial letter. We are still waiting for a reply but will follow up and keep you informed. Correspondence between our Coalition and the University is linked below. We had a great meeting on March 9th with updates on Organizing, Contract Implementation, Healthcare, Union Committees, and Legislation. If you were not able to attend, a PDF of the powerpoint is linked below.